Are you one of the many women who do not have pierced ears? THE EARRING COLLECTION recently received lots of enquiries asking whether our earrings were available with clip-on fittings for non-pierced ears. Most of these requests were for our drop earrings. It appears to be difficult to find good quality silver or gold drop earrings for non-pierced ears. With drop earrings made using precious metal and real pearls or gemstones, many ear clips are either too weak to hold them securely, or they grip uncomfortably.....and some are just plain ugly - which somewhat defeats the object! We have investigated and experimented, and have finally found the perfect fittings made using solid sterling silver, which hold firmly, are comfortable to wear and look great. 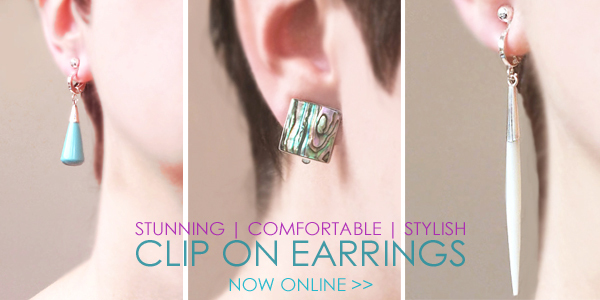 So, now we’re able to convert many of our favourite drop earrings to a clip-on style.